The Department of Music in the The School of Arts and Social Sciences welcomes Simon Emmerson as part of its 2017-18 Research Seminar Series. The seminars are open to all - no registration necessary. Simon Emmerson reviews the evolution of his thinking about the use of live electronics in composition. For him this means primarily live instrumentalists or vocalists with electronic transformation, but also sometimes pre-recorded sound, too. In this presentation he discusses why as much as how this is done. What does the use of live electronics add? He discusses ideas of poetics in his work. He will look in detail at the works performed in the previous evening’s concert. Simon Emmerson is Professor of Music, Technology and Innovation at De Montfort University, Leicester. 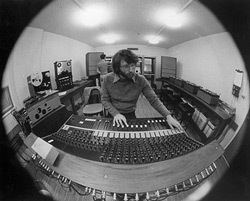 For 30 years (until 2004) he was director of the Electroacoustic Music Studios at City University. Commissions include IMEB (Bourges), GRM (Paris) and Inventionen (Berlin) festivals; Darragh Morgan, Philip Mead, the Sond-Arte Ensemble (Lisbon), Carla Rees. Recordings of his works are available from Sargasso. Principle writings include The Language of Electroacoustic Music (Macmillan, 1986), Music, Electronic Media and Culture (Ashgate, 2000) and Living Electronic Music (Ashgate, 2007). He was founder Secretary of EMAS (The Electroacoustic Music Association of Great Britain) in 1979 and a Trustee of its successor organisation ‘Sound and Music’ 2008-2013. In 2009-2010 he was DAAD Edgar Varese Visiting Professor at the TU, Berlin, and Keynote at ICMC 2011 (Huddersfield).